There was a NY 3 piece band playing right outside of Cafe Du Monde, and we sat listened to them while sample the Beignets and Chicory Coffee. The band played covered songs in easy listening fusion jazz, make you want to sit there forever. We walked through the water way, and cut through the French Quarter, tried to find Doreen at St. Anne and Royal, but she already left for the day; it was 3pm and after the Hurricane & Louisianna Lemonade, we were all in favor of walking back to the hotel to chill out a bit before heading out for dinner. 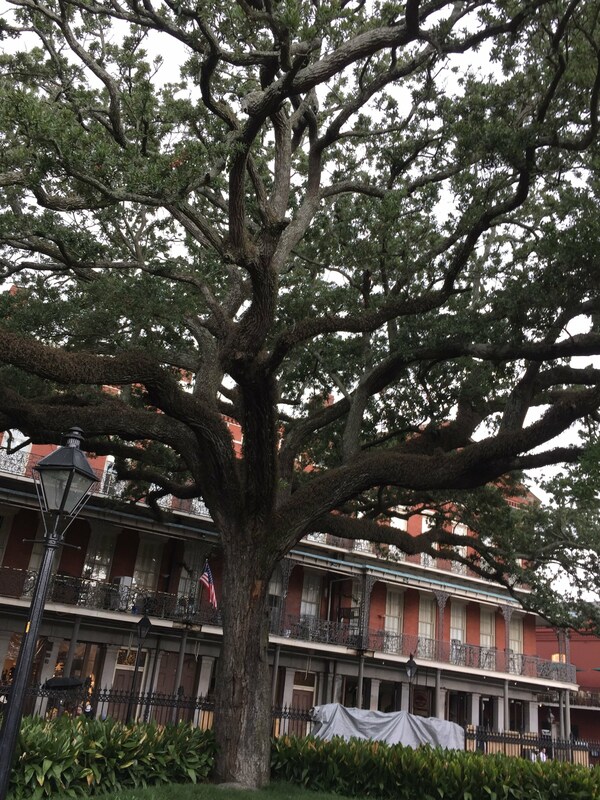 The gas lamp, the iron works balcony, the arch doors, the hundreds years old Magnolia trees in Jackson Square park, this is a scene that you can't duplicate anywhere in the world. A picturesque resort town, with a gigantic lake smacked in the middle. Restaurants spreads along the shore, and beautiful walk-way along the beach. It's still early in the Summer, the temperature is perfect at 18C. We walked to the restaurant, using Wifi and had lunch, while admiring the lake. We came back to the same restaurant for dinner that night, then walked along the beach before calling it a night. We stopped at a restaurant, outskirt of Siena to have lunch. Beautiful restaurant, and wonderful foods. As usual, we completely polished every plate. It's a 4-day long weekend, and we have to drive to NCSU to bring personal stuffs to Bảo, so we decided to have a short vacation at Myrtle Beach. The Amtrak Carolinian number 79, Southbound train starts from New York, slight turns to the West to pick up more passengers from New Jersey and Philadelphia, then heads south through Washington DC, Virginia, North Carolina, and finally to South Carolina. We boarded this route last weekend to take Bảo back to school. It is a 5 hrs driving affair, so previously we had been using the van and making it a short weekend vacation for the whole family. 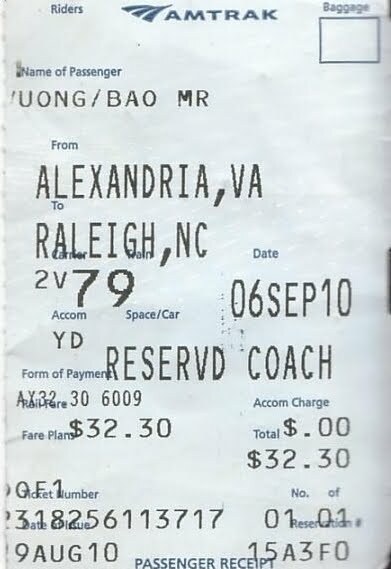 With Bảo's Student Advantage discount card and Thuỵ and Huân at half price, we purchased the train tickets for much less, average of $50 round-trip train ride for each. Comparing to air plane, trains has ample seating space, two row of seats on each side, and we can even sit in the eating car, with big table, sipping coffee while admiring the scenery through the big window. Oh yeah, the electrical outlets! Available right at the seat, so no need to worry of the laptop running out of juice. Also, the fold-out tray has more space to accommodate the 17" laptop instead of 10" netbook, even when the seat in front is fully inclined. On Saturday, before heading to the Alexandria train station we picked up the subway sandwiches for our lunch, since there is no free drink or snack on train. [Digress] As usual, I picked the hot pastrami, with the tender corn-beef slices, encrusted with peppercorn and spices. The only thing that I would like to protest is that hot pastrami is not one of the 5-dollar-foot-long deal selections [/Digress]. We arrived at the station early, and the Masonic Temple is right across the street, thus we decided to spend a quick tour there. The Masonic Temple is a monument, built by Free Mason society members, to honor the society as well as the America founding father: George Washington. From the outside, the tall tower structure seemed even higher since the building is built on a hill, dominate the whole area. We did not take the elevator to the top, but I bet on the clear sky, we can easily see the Washington Monument from the tower. Inside, it is magnificent. Everything is built with granite and marble. Even the whole stairs, with baluster and hand rails, are carved marble blocks. The unrivaled craftsmanship along with finest materials, the monument is built as if to endure time and events play out in the country. After the tour, we drove across the street into the train station parking lot. Inside, the machine scanned our ticket confirmation and printed for us all tickets. As the train pulled into the station, it made two quick and loud whistle. The train conductor placed the steps at the door for us to board the passenger car. The cars were pretty packed, did not have seats available for us to sit together, thus we had to split up, and took our seats as the train started to move. About 15min later, I asked Bảo & Thuỵ to go to the eating car, and see if there are table available for all of us. Thuỵ came back and we all grabbed our backpack and walked toward the eating car. The eating car has 10 big tables, with bench seats on both side of each table. We took two table, and spread out our foods. Eating on the train was much more enjoyable, and sure beat the driving the van for 5 hours. The train stopped at several stations before pulling into Raleigh. Since the Raleigh station is a fairly remote bus stop, bus comes by only when there are passengers wanting to getting off. So, we approached a taxi and ask for the price to the Brownstone hotel, which we were going to stay for one night. The taxi driver in front of the line reluctantly replied in a disappointing voice, "Only five bucks". I quickly realized that: waiting for customers, all taxis would form a line, the one in front of the line will take the first customers and the next taxi would pull up taking the first position awaiting for the next customer. So, if the taxi fare is so low, only $5, and that will cause the driver to lost his place in line, which he had been waiting all this time. Checked into the hotel, dropped off our luggage in the room, we then headed out to Bảo dorm, which is only about 1/2 mile from the hotel. However, walking against the 12 degree-F wind chill factor, it felt like a long journey across Bering strait. At the dorm, we helped Bảo put away the clothes and stuffs, and walked to the main street to find something to eat. Again ... we walked in the cold, I now missed the van! Bảo disclosed that Bà's gift, a closed-knit ribbed winter hat came at perfect timing and occasion. We came up to a fairly crowded restaurant, David's Dumpling and Noodle Bar, and with a reasonable price range, average of $10 for dinner, and decided to check it out. Inside we had to wait about 20minute, and all agree that we rather wait here in the warm, comfortable waiting area of the restaurant than to trek in the cold with uncertainty of finding another restaurant in the price range. Besides, we all wanted to check out "Phở", which is one of the noodle bowls they had on the menu. During the wait, I talked to the lady at the register, and learned that the place is only about 6-month old. Her family is Chinese, but David, her husband was grew up in Chợ Lớn, Vietnam. The restaurant decoration is modern and hip, with huge framed photos of the David, owner and chef, is cooking with broad smiling. Dining wares are all white and modern shapes, like wavy plates, cone shape bowls, and triangle dishes. The place was festive, and packed. Only opened for 6months the place looked like doing very well, even though the foods were not that ... authentic. Western Caucasians in North Carolina could not tell the differences, I guess. Done with dinner, it was only around 8pm and I still feel a bit ... empty. On the way back to the hotel, we stopped at a small convenient store to pick up snacks for tomorrow train ride, and perhaps tonight at the hotel. I picked up two cup of noodles, the spicy kind! It's not that often that I find this spicy kind. Like old time, we spent our night in a small two double-beds hotel room; with Bảo, it seemed complete, that we all together and as one single unit. With that happy feeling, I slowly drifted to sleep, disregard the uncomfortable situation of being sandwiched in a double bed. We woke up early the next day, and located the closest Subway sandwiches store. On the way to the sandwiches shop, we picked up donuts at the Dunkin, especially the French Curls. We got to Subway to buy our lunch meal, and again I ordered the pastrami. But strange, the lady put two frozen hamburger-looking slabs into the bread. When we repeated the order, she said that this is the "pastrami" at that store. We had no choice but to give it a try. It's tasted more like country-fried steak than the corn beef slices. Bảo walked and stayed with us at the bus station, until the bus arrived. The bus took us to the Raleigh station, there we waited for about half hour before the train came. Thuỵ took the opportunity to do his homework, Huân was lying on his stomach, enjoying his book, and Hương was catching up on the movies. I went outside to the track, snapped few photos. The train home was much more quiet. Since it fairly empty, we found our seats, next to each other. We decided to stay in our seats and not go to the eating car. Each of us was chasing our own thoughts and activities; I watched countless of previously recorded tv-shows on the netbook. The train pulled into the Alexandria around 5pm. We drove home, none of us admitting it, but I think we all missed Bảo. It was then that I realized how valuable it was, for the last three weeks, that Bảo was with us. I am now looking forward to March, to the Spring Break. I woke up to the sound of Bảo's bedroom door opened, it was around 5:30am. It was still dark outside, the fainted light illuminated the hallway outside of our bedrooms indicating the basement light was on. The staging area was in the basement, that where we put the stuffs which Bảo is going to bring with him later on today. I woke up, made my coffee and walked by the staging area. Bảo was almost done: the printer, the desk stuffs, clothes, bedding, and also a washing detergent bottle! We finished packing, and drove off around 8:30am. It's 5hr-trip to NCSU and don't want to have many stops, so we stopped by McD to get our breakfast before get on the freeway. Looked like everyone had the same agenda, the freeway was packed. The average speed was around 30mph, and took us a good 3hrs just to get off 95 onto 85, heading toward Raleigh, NC. The drive on 85 was much better, and I was able to make up some lost time earlier. Glanced at the rear-view mirror, everyone in the van was sleeping, which was understandably, since we were up quite late last night. The highway is a two-lane long, empty with tall trees lined up the side, the view is going to be very nice in the Autumn, I think. I turned on the radio, listened to the music to keep me awake, a Journey's song was on. We pulled in the parking space, right outside of the Owen Residential Hall and started to unload. A young student approached and asked if we need any help carrying stuffs to the dorm. It was quite a pleasant surprise! We did not have that many stuffs to carry, but we do want to talk and get to know people there, so we had him helped us with a small luggage and walked with us to the room. We learned that he belonged to a Christian group, and just volunteered on helping freshmen moving in. Such a nice gesture, I thought. The hall way was busy with students & families moving in. We met the Residential Assistant, and helped Bảo unpack & set up the room. His room mate, was not there but his stuffs: Two family size luggage, a TV and boxes piling on his desk. After unpacking & setting up the room, we headed to the bookstore to get the text books. The plan was to see if there are any used books, but all required books are new, and we plunged down $380 for books. Afterward, we went to the hotel, so we can check-in. We stayed at the hotel for about 30min, and then I & Thuỵ took Bảo back to the school, which is only ~10min. drive. Huân & Mẹ stayed & went swimming at the hotel. We dropped off Bảo at Owen for him to attend a welcome meeting at 4:45pm. It's a welcoming freshman walking tour, taking the new students to various places & activities. We was driving back to the hotel when Bảo called, and he said that the meeting is actually for Sunday and not today. So I turned the van around, and took him back to the hotel. We relax at the hotel for about an hour before heading out to eat. We decided to try a well known BBQ place, called The Pit. It's right in Raleigh downtown, and about 5miles from our hotel. As we approaching the place, there are groups of people already waiting outside the restaurant, and we thought that it's going to be a long wait before we can get in. But amazingly enough, as I drove the van around to find parking space, Mẹ called and she already found us a table! Sitting at the patio table, the evening is falling & we watch the train coming from a far. As the day winding down, I had a dark ale and half rack BBQ same as Bảo. Mẹ ordered salad, Thuỵ got meat loaf, and Huan had roasted chicken. But the high light was in the appetizers of BBQ fries & fried green tomatoes, and the dinner's basket full of hush puppies & corn breads. I was looking across the table, with the sunset casting a mild warm glow on our head, Bảo seemed more matured, confident, and determined. The ribs are quite tender and moist, with light smoke flavored. After the first piece, I thought to myself: I don't mind having a full rack next time! We took Bảo back to the school after the dinner. Much of my surprise, the school is only ~2 miles away from the restaurant. Bảo decided to spend the night with us at hotel instead of dorm, so we wait for him to gather few stuffs at the dorm & come with us back to the hotel. While waiting, I took Huân to check out the First Year College Common building, right across the Owen Residential Hall. It a nice, lighted facility, opens 24hrs with attendant, and a place to go if you forget your dorm key. All packages also arrived there first, before distributed to the students. It also has a full computer lab, and additional meeting/study group rooms. A little further up the building, there was an outdoor movie night at the Witherspoon field, showing Avatar. I was quite happy to have another night with Bảo. We played monopoly and Huan fell asleep in the bed room while we were playing in the next room; as if he felt content & able to sleep alone, knowing all of his love ones are around him. Next morning, we had (free) breakfast at the hotel. With hot scramble eggs, sausages, bacons, potatoes (top-off with gravy from the Grits & Biscuits). We shopped at Target for the sale and necessary items, and took Bảo back to school. We had Bảo to try the ATM machine, to deposit few checks; but for some reasons, the PIN did not work. We gave up & went to have ice cream instead! :) We then went to the super market, to stock up snacks & dried foods, Bảo wanted to have a tray of cup-o-noodles, even to much of Mẹ's disapproval on the nutrient value. Drove back to the dorm & bid farewell, we had our usual group hugs. It was hard to say good bye, but it was 2:30pm and we went over our planned departure time for more than 2hrs. We knew that we have to part, but it was a trip which no one wants to take. The trip home was quiet, and also long. We got home around 8pm, ate left over foods and ... very happy that Bảo called. We talked about setting up the wireless router, and tested out the much improved speed afterward by using the Skype video. Bảo indicated that he may accompany the Target runs, which the university bus having a special route, taking students to the nearby Target to shop for last minute forgotten stuffs. We forgot to stock up drinks for Bảo. We all went to bed around 11pm. Lying in bed, I looked over Bảo's bedroom. It was usually lighted with door closed. But not tonight, it was dark and the door was open. We are planning for the upcoming trip, taking Bảo to NCSU on August 13th. We was there many times, but did not actually know much of places in the area, so this time we want to see if we can visit to different places, learn more about eateries, and perhaps being impressed as well as entertained of what North Carolina has to offer. Downtown area, how does it look like? The civic square looked interesting: big open area, surrounded by state buildings. About two weeks ago, except for Thuỵ, we went to NCSU for the orientation. It's a two-day session, with Bảo staying overnight at the student residential hall, and we were in the hotel. We spent most of our time at the university, attending the sessions, dining hall, and walking to various buildings in the campus. The weather was very hot & humid, so we kept outdoor activities to minimum and very much stayed in the A/C facilities.